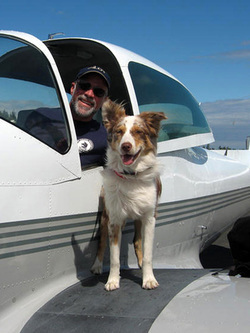 The Australian Shepherd should be clever, debonair, light-hearted, endearing, biddable, intuitive, watchful, protective, athletic, helpful and devoutly loyal to its family. Aussies should be versatile and adaptable, both at work and at play; Physically and mentally able to adjust well into varied lifestyles - enjoying activities such as herding, agility, Frisbee, Flyball, Search & Rescue, and therapy work. 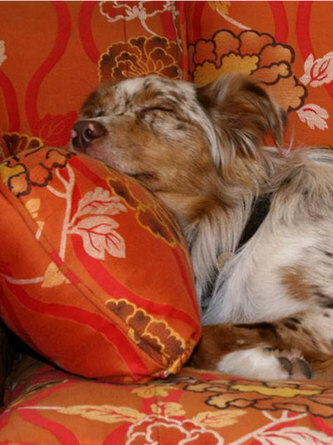 As a breed, the Aussie, regardless of size, should have the ability to “do it all”, yet not be “driven” to excess - enjoying an active lifestyle, yet also content to lounge indoors with its family. 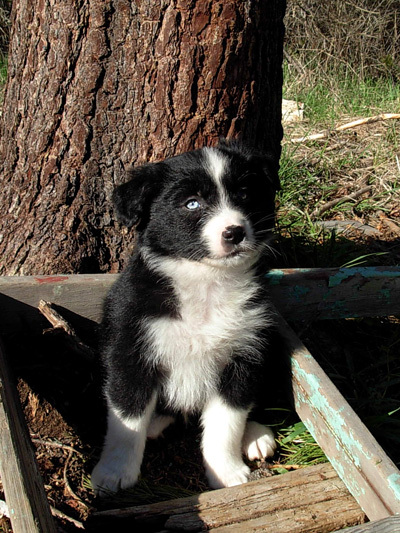 Learn more about the AUSTRALIAN SHEPHERD and its smaller counterpart. With over 50 years combined experience breeding dogs and raising puppies, we understand the qualities that make a dog truly "outstanding". Our family maintains a small, elect breeding program; Beautiful, moderately-sized Aussies with proper structure, instinct, and impeccable bloodlines... Exceptional, smaller dogs - true to the original standard. More important than text-book basics, as a family with young children, we have placed great emphasis on sound, family-oriented temperaments, and chemical-free, natural health care. It is likely you have visited many sites before arriving here. Every breeder wishes to portray their particular breeding program as the “best”. Naturally, we could follow suit, boasting of Champion lines, Hall Of Fame ancestors and renowned working ability. We could brag about our pups excelling in agility, obedience, therapy, Frisbee & Search & Rescue - quite frankly, that would make us no different than sites you have already browsed. At this time, we are one of only a select handful of Naturally-rearing Australian Shepherd breeders in the entire United States & Canada! We are proud members of the Natural-Rearing Breeders Association, and are outspoken pet advocates with regard to the proper care of our lovely furred companions. 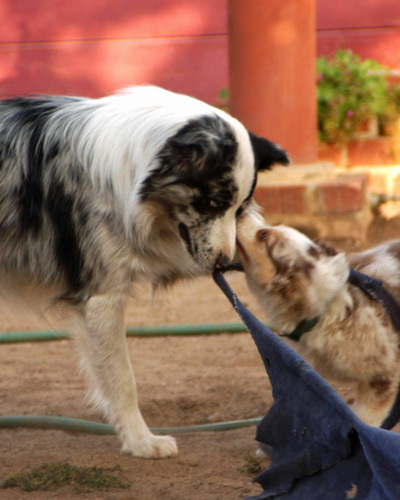 Our “natural-rearing” program ensures our puppies are given the very best start – on all levels! They are fed a natural, species-appropriate diet; they are not exposed to harmful chemicals; and all of our puppies are raised in our home, with constant interaction with our home-schooling family. Learn more about NATURAL REARING. 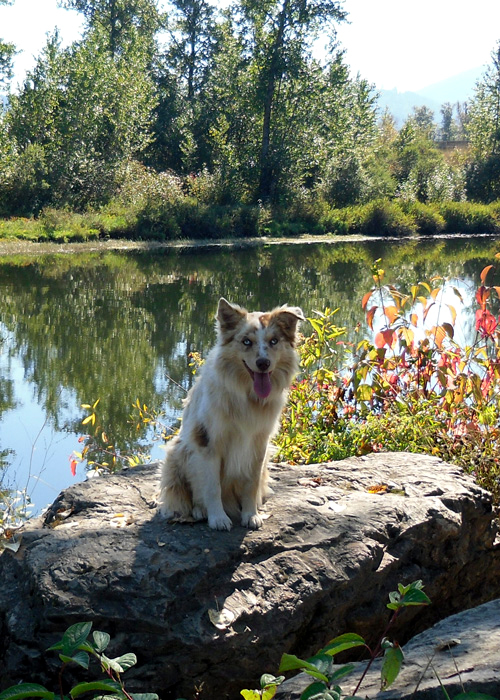 If you are new to the Australian Shepherd breed, we hope you will share the adventure of owning one, or a couple, some day! It is a life full of humor, loyalty and unforgettable intelligence. 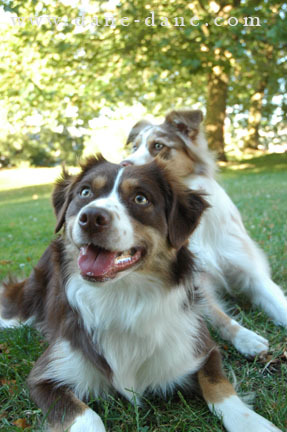 Please enjoy our site, photos and consider us blessed, as there is no better friend then an Aussie! If you would like more information regarding our puppies or natural-rearing program, we would love to visit with you! Be sure to review our KERRY PUPPIES page to learn more about our pups and to inquire about joining our extended RunAmok family! We would love to encourage you to visit our NATURAL REARING section. Proper, species-appropriate nutrition plays a vital role in keeping our companions healthy & happy! Australian Shepherd & Kerry Blue Terrier! Wishing you a tail-waggin' good day!